Swimming is offered (at an added cost) through the Mount Pleasant Recreation Center. During the summer we take them weekly. Children learn the basics of swimming safety and how to swim. 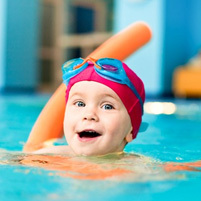 Swimming is offered to ages 2 1/2 years old & up. They learn the basics of swimming as well as water safety that is appropriate to their age. At What Age Should Children Learn to Swim? This does not mean the young children should not learn how to swim. This means that parents need to use common sense when it comes to kids and water safety. Children should wear life jackets when on a boat or dock. NEVER even for a moment leave kids unattended in a pool or body of water. Even a kiddy pool. If you have a pool or live in an apartment complex with a pool make sure it is secure. Pool drains should have a safety cover. Children need to continue to learn to swim. Parents and pool owners need to learn CPR. Do not use inflatable devices in place of life jackets. If you can go to a pool, beach or lake that has a lifeguard. Educate your self about drowning risks and teach them to your children when appropriate. When making the decision to give your child swimming lessons, if you have concerns you should discuss it with your child’s pediatrician.